North Atlantic Books, 9781556438806, 520pp. "Dr. Maté’s latest book is a moving, debate-provoking, and multi-layered look at how addiction arises, the people afflicted with it and why he supports decriminalization of all drugs, including crystal meth.… [In the Realm of Hungry Ghosts] reads not only as a lively textbook analysis of the physiological and psychological causes of drug addiction, but also as an investigation into his heart and mind." "It’s time to give Maté … the Order of Canada for this erudite and sensitive book about the lives of Downtown Eastside intravenous-drug users, the neurobiology of addiction, and the folly of the war on drugs. It’s compulsively readable and packed with new scientific discoveries about addiction. If you know the parent or sibling of an addict—or the prime minister, for that matter—please give him this book." "I recommend this wonderful book for anyone struggling with the heartache of addiction personally or professionally. Dr. Maté makes the thought-provoking and powerful arguments that human connections heal; and that the poverty of relationships in the modern world contribute to our vulnerability to unhealthy addictions of all manner. His uniquely humane perspective—all too absent from much of the ‘modern’ approach to addictions—should be a part of the training of all therapists, social workers, and physicians." "Gabor Maté’s connections—between the intensely personal and the global, the spiritual and the medical, the psychological and the political—are bold, wise and deeply moral. He is a healer to be cherished and this exciting book arrives at just the right time." "With unparalleled sympathy for the human condition, Gabor Maté depicts the suffocation of the spirit by addictive urges, and holds up a dark mirror to our society. This is a powerful narrative of the realm of human nature where confused and conflicted emotions underlie our pretensions to rational thought." "With superb descriptive talents, Gabor Maté takes us into the lives of the emotionally destitute and addicted human beings who are his patients. In this highly readable and penetrating book, he gives us the disturbing truths about the nature of addiction and its roots in people’s early years–truths that are usually concealed by time and protected by shame, secrecy, and social taboo." "Dr. Gabor Maté distills the suffering of injection-drug users into moving case histories and reveals how clearly he himself, as a music collector and workaholic physician, fits his own definition of addiction. Informed by the new research on brain chemistry, he proposes sensible drug laws to replace the War on Drugs. Inspired by the evolving spirituality that underlies his life and work, he outlines practical ways of overcoming addiction. This is not a fix-it book to hurry through, but a deep analysis to reflect upon." "A harrowingly honest, compassionate, sometimes angry look at addiction and the people whose lives have been disordered by it." "Gabor Maté’s latest book is a sprawling but fascinating look at addiction that is part science, part diatribe, part character study, and part confessional.… The writing is powerful.… the book leaves the reader with a profound sense of empathy and understanding for some of society’s most marginalized victims. "[E]xcellent.… One of the book’s strengths is Maté’s detailed and compassionate characterization of the afflicted addicts he treats…a calm, unjudging, compassionate attentiveness to what is happening within." "Maté’s subjects are the living, breathing embodiment of Canada’s grimmest statistics for HIV/AIDS, hepatitis, homelessness, crime, abuse, neglect, overdose, and death. More than merely poor and disenfranchised, they are truly the lowest of the low, reviled by society and demonized by law enforcement. [In the Realm of Hungry Ghosts] is enormously compelling and Maté is admirably, sometimes inexplicably, empathetic to all who cross his path." "I highly recommend Hungry Ghosts to everyone seeking insight into addiction. Gabor Maté’s masterful and impassioned treatment of the topic is a welcome relief from the tired old thinking that has kept us from dealing effectively with it for the last 100 years." "It seems odd to use the word ‘beautiful’ to describe a book that focuses, frequently in graphic, unrelenting detail, on the lives of some of the most hopeless outcasts of our society: the hard-core street addicts with whom Dr. Gabor Maté works. Yet that’s the word that came repeatedly to mind as I read In the Realm of Hungry Ghosts. It’s not only the grace of Maté’s writing, though that’s certainly a great part of it. It’s the sense of compassion that infuses the entire book, the author’s continued faith in and affection for the men and women with whom he works, even when he is the victim of their drug-fueled abuse, racial epithets, and thefts. Maté offers no easy fixes (pun intended), but does offer hope and understanding." 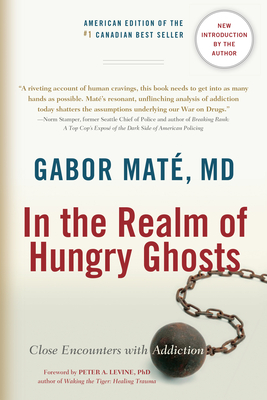 "In the Realm of Hungry Ghosts looks at addictions, how they work, who experiences them and what can be done.… The book is a survey of scientific evidence on addiction, but it is haunted by Maté’s patients who are wrestling with poverty, violence, mental illness, drug addiction, HIV/AIDS, hepatitis, the authorities, their pasts. We read about the depths of addiction, but also the persistence of humanity under the worst of conditions.… That the well-off and the destitute are considered together in this book reminds us that addiction transcends class." "[In the Realm of Hungry Ghosts] is a taste of a different kind of victory—over our own impulses to leave 'undeserving' souls outside the human circle of affection and good will."